With iOS 11's multitasking support, you'll need to learn new gestures, but in the end you'll be more productive. 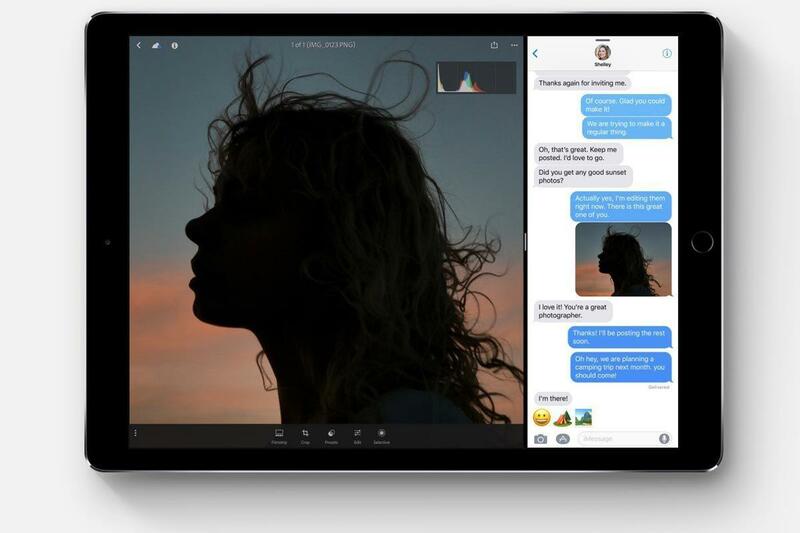 With iOS 11, Apple is transforming how multitasking works on iPads. You’ll need to learn new gestures and change how you view the Dock, but overall the changes are a major step forward in making the iPad a more powerful productivity device. On iOS, the Dock has never been anything more than a special strip of apps that stays visible on every page of the Home screen. But for iPads running iOS 11, the Dock behaves differently—and this means your approach to what apps you put in the Dock should be different, too. In iOS 11, you can call up the Dock with a swipe up from the bottom of the screen. You can quickly switch between apps without ever going to the home screen, via a quick swipe and tap. It takes some getting used to, but it’s fun to be able to switch directly between apps with only a couple of gestures. The Dock’s a lot more capacious in iOS 11 on the iPad, too. On 9.7-inch and 10.5-inch iPads, you can place 13 apps in the Dock, and on the 12.9-inch iPad Pro you can fit 15. There’s a lot of room if you want to use it, though keep in mind that the more apps you put in the Dock, the smaller the app icons get. But the apps you put in the Dock aren’t the only ones there. The far right side of the Dock is populated automatically by the system with up to three “app suggestions.” Generally, though not always, these are the most recent apps you’ve used that aren’t already in the Dock. This is an extremely helpful feature when I want to pop back to a non-Dock app I was just using. Apple’s repurposing of the Dock in iOS 11 will prompt you to reconsider what apps you put in the Dock and why. I’ve always put my favorite apps in the Dock on the iPhone and iPad, and why not? They’re on every screen and the very bottom of the screen is prime real estate, since it’s generally closer to where my fingers are. Yes, you should still keep your very favorite apps in the Dock for quick access. But since the Dock is now one of the main ways to kick off multitasking on the iPad, you should also give consideration to the apps you’re most likely to use in multitasking contexts. It’s possible to add an app to multitasking without it being in the Dock, but it’s not efficient. 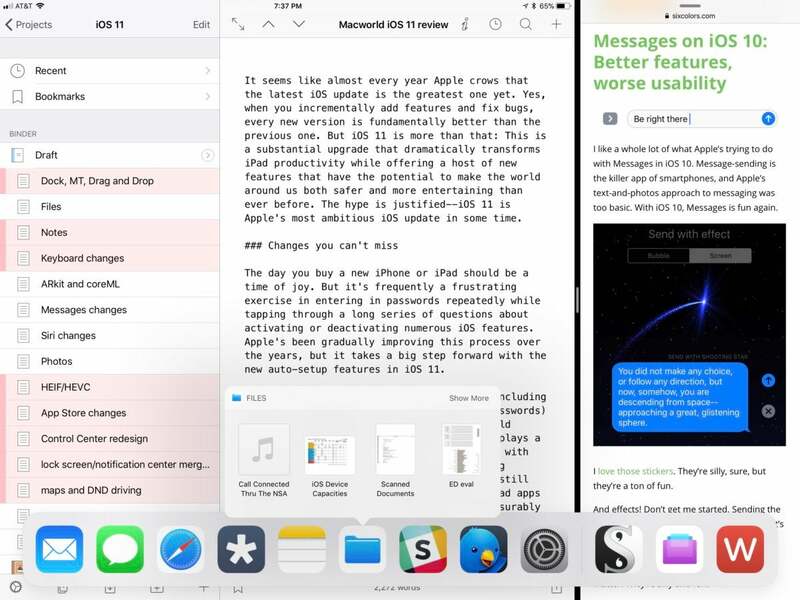 If you use an app in multitasking mode, it should be in the Dock if at all possible. As a result, the text editors I use to write articles now live in my Dock, as does the Files app. While it’s not the only way to kick off multitasking in iOS 11, the Dock’s certainly the most obvious way. To add a second app to the one you’re using, just drag it out of the Dock and to the far left or right side of the screen. The app you’re currently using will move aside, leaving room for you to open the other app simply by lifting your finger from the iPad’s screen. If you’re already running two apps, you can similarly drag from the Dock and drop on one of the existing apps to replace it with the one you’re dragging. To place an app into Slide Over mode—which now appears as a floating window on either side of the screen, rather than sliding in from off the right side—you drag its icon in a bit more centrally and let go. If you already have two apps running, you can initiate Slide Over by dragging a third app on the border between the two current apps. On the largest iPad Pro models (the 10.5- and 12.9-inch models), all three apps are active simultaneously; on older models, the back apps are unresponsive when the Slide Over app is on screen. It’s a visual-, tactile-, and simple-to-understand interface. However, things can get a bit weird in a few contexts. You can drag an icon out of the Home screen with one hand while using another to launch an app, and then drop the first app icon into a Split View. You can drag an app out of a Spotlight search window, but the Spotlight search doesn’t disengage, so you’re left to drag an app icon above search results while the app running beneath it opens up space for Split View. As a keyboard user myself, I’m a little baffled why I can’t drag the icons out of the command-tab app switcher, though. 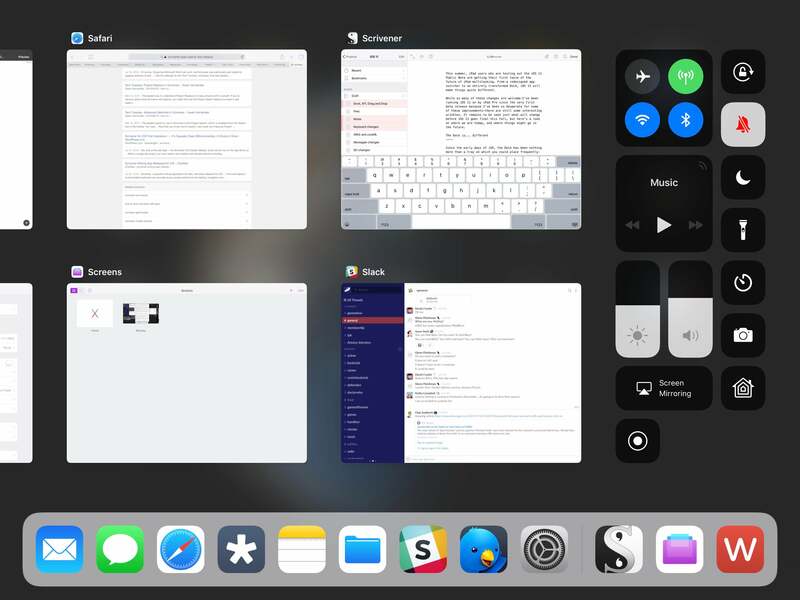 And it would be great to have some keyboard shortcuts devoted to multitasking, too—for instance, what if selecting an app in Spotlight and typing a specific key combination (say, command-right-arrow) automatically placed that app on the right side in Split View? Maybe next time. After the celebrations over multitasking coming to the iPad with iOS 9 died down, I came to a realization: I was spending a lot of time switching between one set of Split View apps to another, because there could only be a single app on the right side of the screen in a multitasking mode. Every time I wanted to switch from one pair of apps (Editorial and Safari, let’s say) to another pair (Slack and Twitterrific), it was a multi-step process that involved switching the left app and then sliding away the right app and picking its replacement. With Split View, you can perform a task like tapping and dragging a URL from Safari into a document you are creating with a text editor. It seems silly now, in the light of iOS 11. Now when you set up two apps in Split View, they stay together. It’s great. Now it’s easy to toggle between different pairs of apps as you work. It’s a huge advance in my productivity. I can see why Apple has taken this approach. When you tap an app icon (in the Dock) that’s open in Split View, it opens that app and its Split View buddy together. If that app was “open” in a few different pairings, which one would open? Things are already a bit complicated: If an app’s in Slide Over, but off the screen, and you tap its icon in the Dock when you’re in an app, it slides in. When you choose that same app from the home screen, it opens—and if it’s in a Split View pair, it opens with its buddy. That makes sense, I guess, but it’s still weird. So, can apps only ever exist once, or should they be able to exist in multiple instances? (If Safari can split itself into two for the purposes of split-screen tabs, couldn’t it split itself into multiple Split Views?) Should all Split View pairs be assumed to be inseparable buddies until the moment the user separates them? Answering these issues provides flexibility—but also adds complexity. I’d like to see Apple’s smartest interface brains find ways to keep adding power to iOS multitasking without making it arcane and confusing for most users. But in general, I love this implementation of multitasking. It really comes across as having been seriously considered by Apple designers, and finds a balance of functionality and simplicity that I appreciate. If you’re an iPad user, the improved multitasking alone makes this a must-have update.